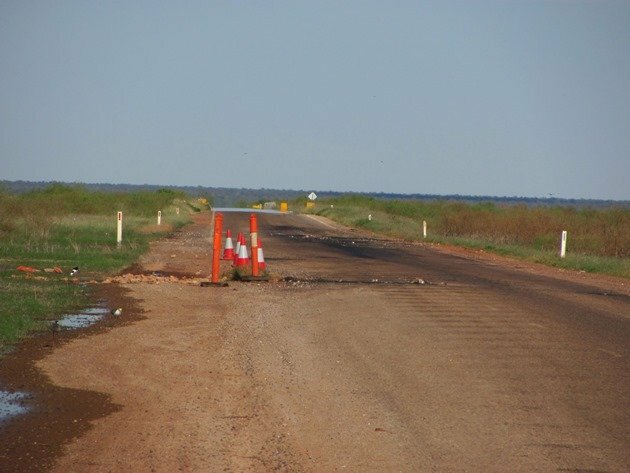 The main highway south from Broome towards Port Hedland takes you through the middle of Roebuck Plains, which is a wide open flat area of bush that is private property. 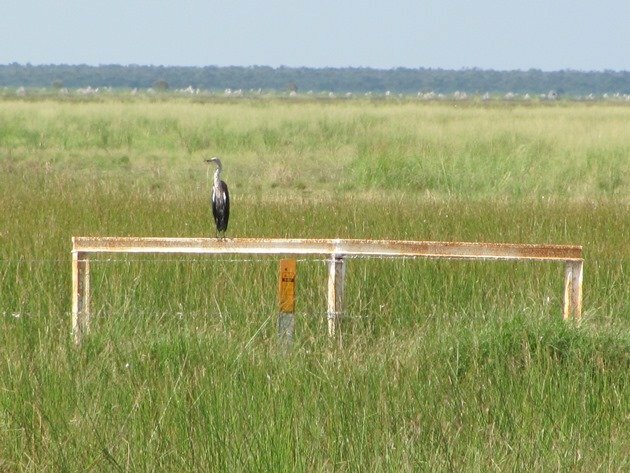 There are excellent birding opportunities along the highway throughout the year and the area still remains flooded from the rains over our Wet Season and it has been a breeding site for several species of birds. There are no bird hides, but we have our own favourite bird hide and ventured out late last Sunday afternoon. The birds are mainly on the east side of the highway, so when the sun is setting in the west the light is very good. 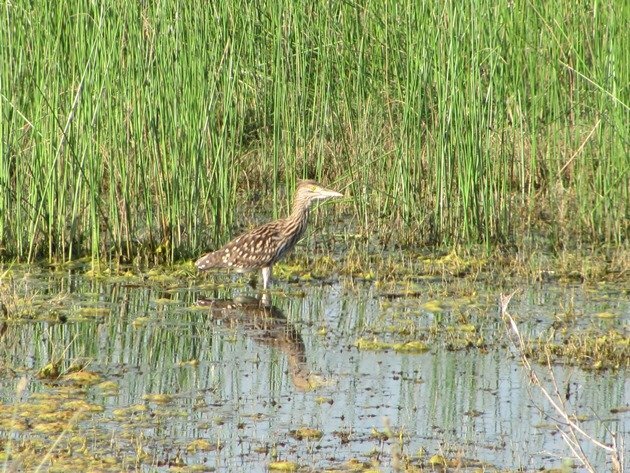 You are able to pull over on the highway and let other vehicles pass as you take in the amazing bird-life. 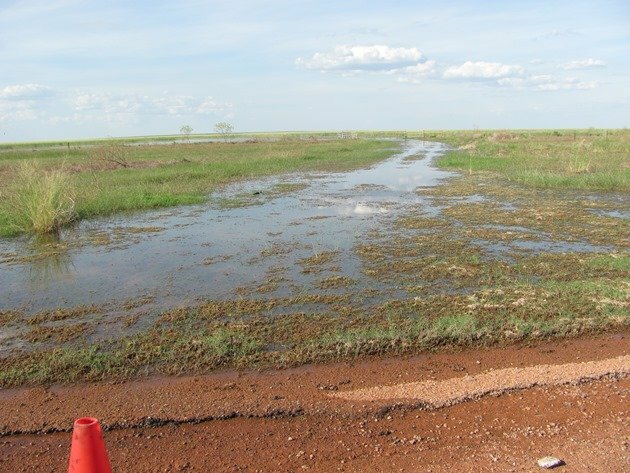 It is not advisable to go too far off the bitumen due to the soft edges and also culverts, which may not be so obvious when the undergrowth is very long. The road is still flooded to the edges in some places and it will be repaired once it dries out, but currently all traffic is moving slowly across this section and the birds continue to feed alongside the road. The road is not as flooded as it was a few months ago, but the side tracks are. 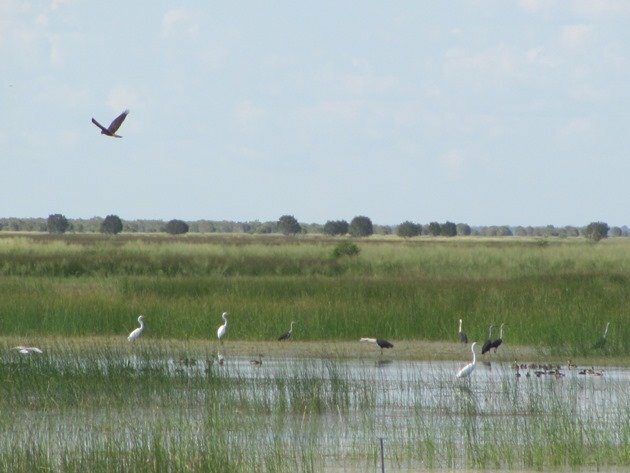 Some of the larger remaining pools of water are lined with Great Egrets, White-necked Herons and White-faced Herons. There are Australasian Grebes, Wandering Whistling-Ducks, Pacific Black Ducks and Little Black Cormorants present and also Magpie Geese. Magpie Geese are not always present in the Broome area, but this year good numbers came and they also bred in this area to the south of Broome. 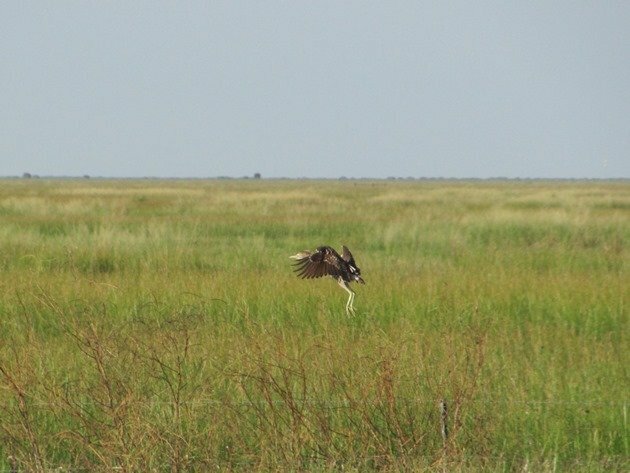 Various raptors were present including Swamp Harriers, Spotted Harriers, Nankeen Kestrel, Australian Hobby, Peregrine Falcon and Brown Falcon. The Black-shouldered Kites that we usually see in the area were not present on this trip. 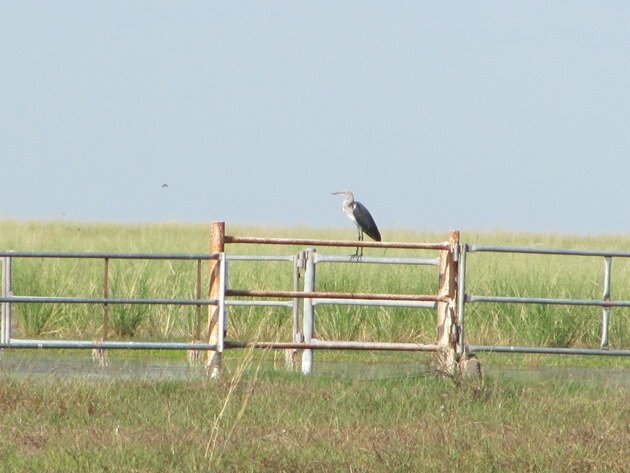 Several of the White-necked Herons had chosen to stand on the gates around the station property rather than stand in the flooded undergrowth. The numbers were not as great as last June, when we had our wettest June day on record and over two hundred were present in the same area. 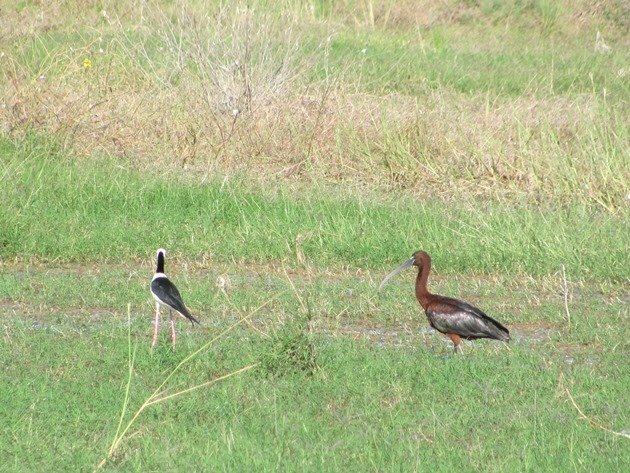 All three species of Ibis were present with Glossy Ibis far outnumbering the Straw-necked Ibis and Australian White Ibis. Large flocks circled once they were disturbed by both the Swamp Harriers and Spotted Harriers as they flew low over the reed beds. Black-winged Stilt were present right across the floodplain and they had also bred over recent months and young birds waded through the pools with their parents. There were also families of Red-kneed Dotterels and Masked Lapwings. As always the advantage of being in your vehicle is that you can incredibly close to these birds that are feeding alongside the highway and even with a small camera you do have opportunities to take photos at quite close range. Despite this being the main highway and the large amount of traffic including trucks, cars and caravans there were very few bird fatalities. 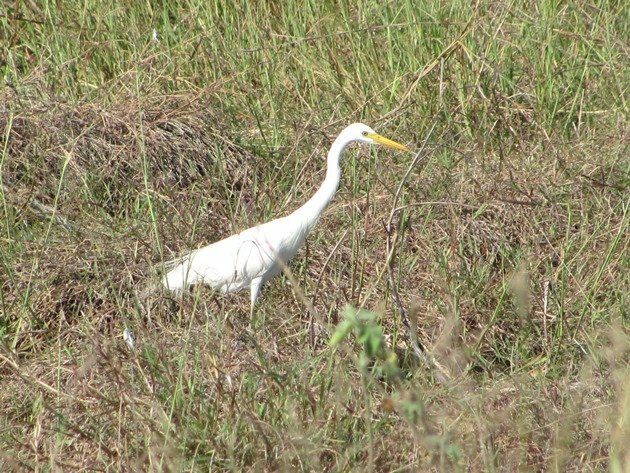 An Intermediate Egret was busy feeding right beside the highway as we moved slowly by. 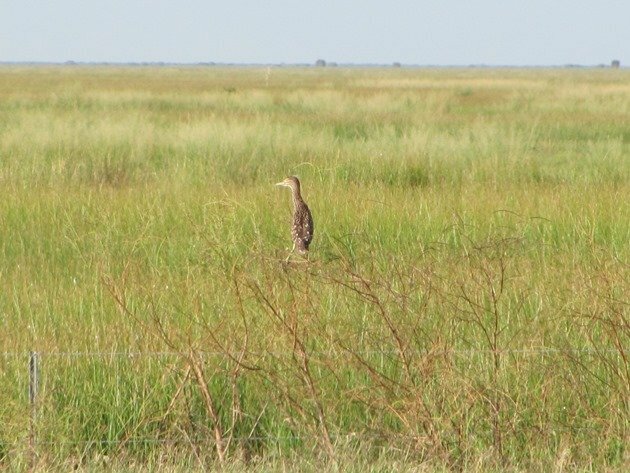 The highlight of our trip came as we were on our way back after turning around at the far side of the open plains and we saw a juvenile Nankeen Night-Heron feeding right beside the road. It was oblivious to our presence and it was not until another vehicle passed that it leapt up and somehow I managed to photograph the leap! I had presumed it would then drop down into the undergrowth, but it chose to balance high up on the dry grasses. 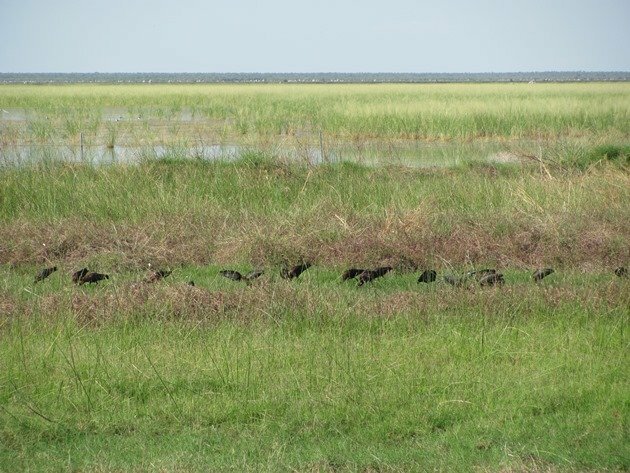 A family of Purple Swamphens crossed in front of a slow moving vehicle and they are not a common species to see in the area, though do reside at another ephemeral lake to the north of Broome. We heard the call of the Golden-headed Cisticola and it immediately dropped in the grasses. There were also several family groups of Red-backed Fairywrens collecting nesting material along the edge of the road. There were 60 bird species recorded along this small section of highway and it is always a great place to see a wide variety of birds not far from town. It was nice to add 5 new birds to my 2014 year list, which had been stuck at the same number for some time! That Glossy Ibis is remarkable and appears quite shiny! Do they all shine like that? The black feathers easily appear green and purple in different light and very “glossy”! so, yes….they “shine”!